One of the many reasons to come to Spain is its gastronomy, but being in a group could be a little bit difficult to fit, making reservations etc. We have different options and it will just take a second to find the perfect one for you and your group. In the Madrid Food Tour Experience you’ll have the opportunity to try different kinds of food from different regions of Spain, we have diiferent packs , choose the one that more fits to your group. We will visit different venues where you will try different “tapas” and drinks, including wine, sangria, or beer all depends on the pack you choose. For food, you will always get to try tortilla de patata, croquetas, patatas bravas, ham, cheese and much more. We want you to get the best experience, that’s why your tour will be complemented with anecdotes and stories of the city on the way from one restaurant to the next one. Get to try the cider from Asturias and some of the most famous food from the north of Spain. You’ll have the opportunity to try the local liquor of Madrid; the “Madroño” liquor, your shot will be served in a chocolate glass and of course you’ll get more tapas and another drink. 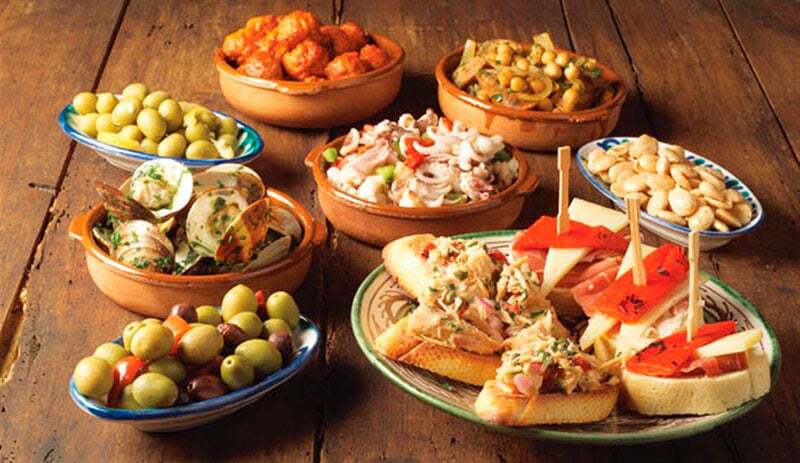 To end this tour we’ll take to another local restaurant where you and your group will get the a mix shared dinner with a variety of different tapas and 1 drink per person. The option 1 is already a great option but if you would like to include some complements to your Madrid Food Tour Experience, you can do it! With this option you’ll get to try the famous Spanish ham: The “Iberico” or well known as “pata negra” as well, plus other different variations from the Spanish pork as the chorizo, lomo and extra cheese and extra drink in the last place. Basically you’ll get option 1 plus many more Spanish flavours, all an experience! Options 1 and 2 look really good, but what if we tell tha you can still make a better deal with this option?. With this you’ll have the opportunity to try also a real “Paella”, real paella? Yes! Not the frozen one you can find in every corner. We’ll take you to a special place well known by its paellas plus everything included in the option number 2. For wine lovers….. in every place you’ll get only premium bottles of wine, well, except in the cider place where you’ll get….. of course…cider.